Hours: The US Gardens are open daily from 10am – 5pm year round. The Garden encourages visitors to come back over and over to see the constantly changing displays and collections. This window into the world contains a wide range of exhibits that covers one hundred and fifty million years of plant evolution. The conservatory focuses on a variety of global climates and environments and the ways nature and plant life impact our day to day lives, and the life of the planet as a whole, including cultural and economic ways. World Deserts: A collection of shrubs, grasses, cacti, succulents, and flowering plants from regions all around the world. Hawaii: Native Hawaiian plants, specifically species adapted to life in the volcanic islands. Children’s Garden: An informal education area where children can come to learn about plants and play in a public garden. Garden Primeval: A unique collection of Jurassic era plant life that date back over one hundred fifty million years. Plant Adaptations: A collection of plants that have shown incredible evolution and adaptation. Garden Court: Showcases plants that have a direct impact in our daily lives, such as those that provide spices, wood, cosmetics, beverages, food, and fibers. Jungle: A recreation of a tropical rainforest underneath a ninety three foot dome. Visitors can journey up to the mezzanine to get an amazing view of the canopy beneath their feet. Medicinal Plants: Plants have been used for medicinal purposes for thousands of years. This collection at the US Gardens illustrates the beginnings of the use of plants for medicinal purposes. Orchids: The US Botanic Gardens is home to an extensive orchid collection of about five thousand specimens. At any time throughout the year approximately two hundred orchids can be found blooming on display in this ever changing exhibit. Southern Exposure: This micro climate within the US Botanic Gardens features plants that are native to the North American Southwest and Southeast, as well as Mexico. Rare and Endangered Species: Threatened, endangered, and rare plants from all over the world are displayed in this constantly changing garden. West Gallery: Our lives are influenced every day by plants. This garden illustrates some of the ways they provide meaning symbols, enrichment, livelihood, and therapy. Bartholdi Park: Designed in 1932, this park was named after the sculptor of the fountain found at the park’s center. All of the geometrical planting beds are arranged in a classical design that is well suited for large gatherings and to showcase the fountain. As society progresses and new styles come to pass, the plantings in the park are also updated to keep up with the times. These days the park acts as a demonstration landscape garden and is used to display new and inventive combinations of plants and garden designs. 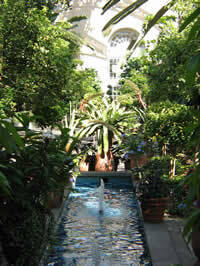 National Garden: The US Botanic Gardens first broke ground on the national garden in October 2001. It was then opened to the public five years later in 2006. The garden was designed to be a series of living laboratories that could offer research and education in the botanical, horticultural, and environmental fields. The project cost ten million dollars and was constructed entirely using private funds raised through donations. Regional Garden: The Regional Garden grew out of inspiration from Mother Nature and a purpose to entice and intrigue gardeners and garden lovers alike. Like most gardens, the plant life is constantly evolving and growing, and the changing conditions offer a new perspective each time you visit the garden. Rose Garden: Few people know or remember that Ronald Reagan designated the rose the national flower in 1986. Roses are timeless, versatile, and elegant, and they have been grown in gardens throughout the course of history. The rose garden of the US Gardens pays tribute to these beautiful and fragrant flowers that have also been used for medicinal purposes and quite often have obtained a certain amount of symbolism in religions around the world. Butterfly Garden: Butterflies are beautiful and graceful creatures, and they provide joy and excitement into any garden they fly into. Few people can deny the majestic and yet delicate beauty these creatures have to offer. 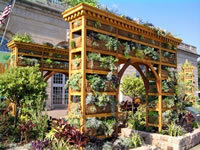 However butterfly gardens provide far more than just aesthetic value. These gardens provide habitats and ecosystems to a wide range of other pollinating insects as well. Hummingbirds share similar interest in plants to butterflies, and these gardens draw ladybugs, lacewings, and a variety of other insects that can be beneficial in controlling garden pests. First Ladies Water Garden: The US Botanic Gardens celebrates our country’s First Ladies with a signature garden that is created from Cold Spring bluestone and granite. Their jobs are beyond description and these women not only support their husbands and our presidents, but they also support the nation in their own manner. The First Lady has always represented traditional family values, and even more recently as our culture and society have grown increasingly complex, they have taken on more and more responsibility. It is only fitting that these women be paid tribute to, in their own unique way.